Hello and welcome to the first post for the December Papertrey Ink Release! The new products you are seeing here will be available in the store at Papertrey Ink on December 15th at 10:00 EST. 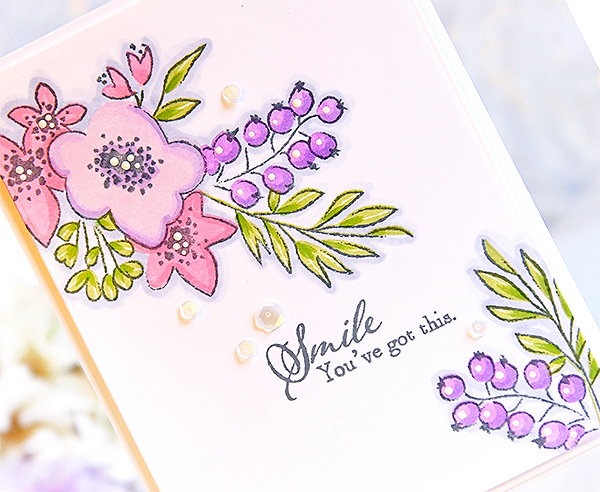 Today I am showcasing a beautiful new floral stamp set with matching dies by Nichole called Fresh Bouquet. This is a very versatile set as you can stamp the outline image and color it with your favorite coloring medium, or use the coordinating solid images. Lots of fun! 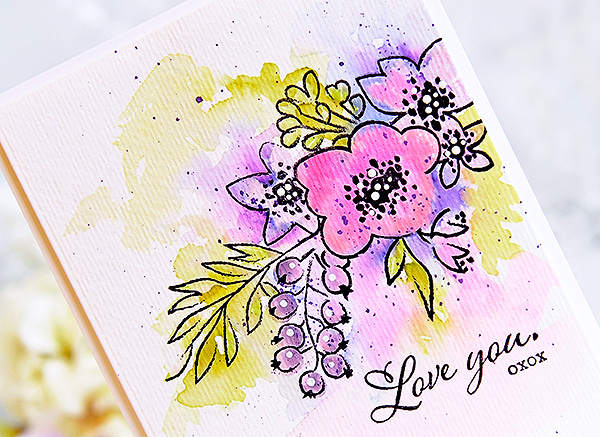 For my first card, I stamped the outline image in black waterproof ink, stamped the solid coordinating stamps, and then used a wet brush and a little more ink to give it a watercolored look. I used Lovely Lady for the main flower and the new Lilac Grace for the smaller flowers. And of course I can't just leave it alone, I had to play and play with it. I used some Royal Velvet and Amethyst Allure around the flowers. After everything dried, I splattered a little Royal Velvet ink onto it and added a few white dots of acrylic paint. The sentiment was stamped with True Black. For this one, I stamped everything with Stormy Sea ink, then used the solid stamps to fill in. Then I went around everything with Copic markers in matching shades to add some shadows to the flowers and leaves. I also went around all of the images with a soft grey Copic marker to make them pop. I added a few white dots of acrylic paint and some sequins. I've added the Copic colors I used to my supply list below. I'm thinking this one might be my favorite. I love the bright colors! 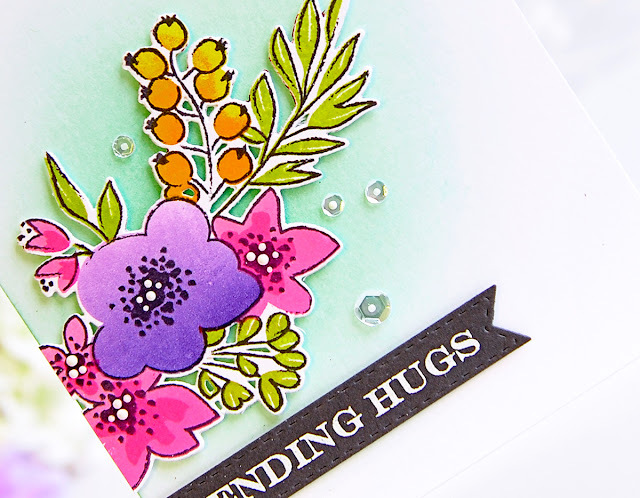 I stamped the outline stamp in True Black this time, and used the MISTI to stamp the solid colors, so I could get an ombre effect on the flowers. The sentiment is from the new Keep It Simple: Sending Hugs stamp set, and is white embossed on Smokey Shadow card stock. I used a round blending tool and Aqua Mist and Hawaiian Shores to blend the background. I added a few white acrylic paint dots and some clear sequins. Thanks so much for stopping by! I'll be back on the 12th for the first group post! Very pretty work, Kay! I think the last one is my favorite, too. I like the bright, sassy colors! You do so well with colors and color combinations. Looking forward to seeing what you create next! :) Hugs!! Happy weekend! Oh, Kay. These cards are so, so amazing. With every on, I'd scroll down the screen and be blown away more and more. Such beautiful cards. This is a wonderful set and your work with it highlights it perfectly!!! 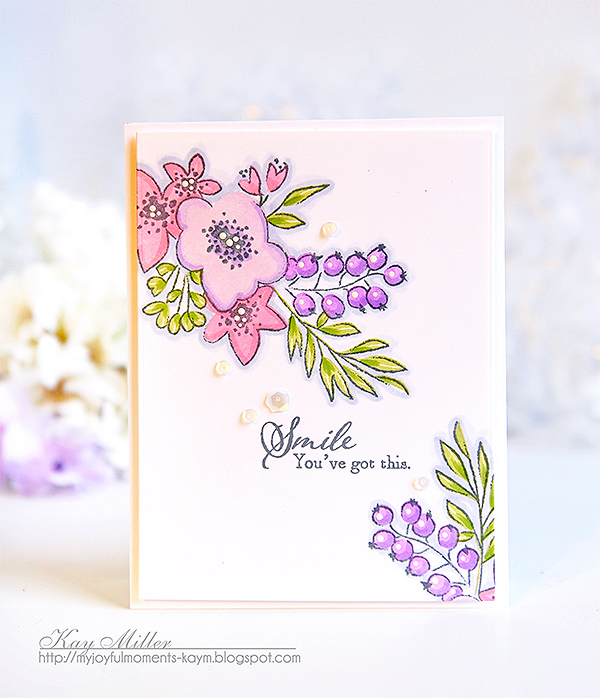 Oh, I love this set, Kay, and the gorgeous cards you created with it! Stunning! I love florals and this one is no exception! Absoultly beautiful and oh so beautifully colored ! Love them all and like you maybe love the last one best! You are the queen of the slight soft watercolor background! Oh Kay!! Your cards are so lovely. I cannot pick a favorite!! Gorgeous cards with the lovely flowers in beautiful color...so pretty!! On a frigid winter day, the lovely colors you have used warm my heart and soul. Very pretty cards. Sending hugs is my favorite. Totally awesome work. Except it doesn't look like work, it looks like joy. Beautiful, Kay. If you forced me to pick a favourite, it would be the first one. Absolutely love seeing your work. Your watercolouring is gorgeous. Nope! No favorites. All amazing. Love the coloring, techniques and white on each and every one. Beautiful projects! I would love to see your ombré technique, maybe a future MIM video?! Absolutely stunning Kay, your cards are all amazing, but I think I love the bright one the best! Oh that is a fun set! 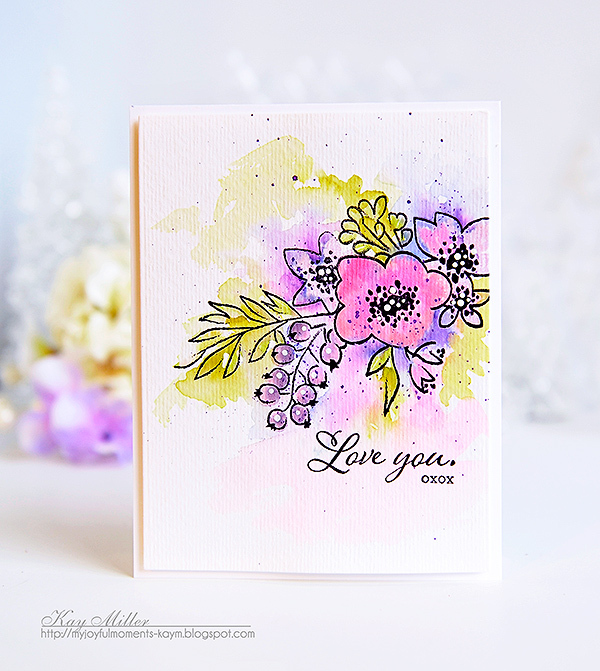 These are lovely, Kay, I especially adore the first card with the watercolor!! Gorgeous cards Kay - stunning - each one! Your watercoloring skills are unsurpassed! Kay, you've created three more beauties here. Your watercoloring is simply out of this world beautiful. Such gorgeous fresh bouquets! Absolutely gorgeous cards, Kay! I think the last one is my fave with all the soft green in the background, but I do love them all! It's going to be hard to resist this set after seeing what you've created...Stunning work, my friend! Soft and gorgeous, both are beautiful! Three works of art Kay!! All beautifully colored! Very pretty and so fun to see the set used three different ways! I love your watercoloring in the first, so loose and gorgeous! The last one....how fun that you achieved this coloring with the MISTI! Awesome! TFS! Gorgeous creations and colors Kay! So inspirational! If I decide to buy this set is all because of you! Oh m'gosh! I really love all three of these beautiful cards. Just pinned each one! I gotta play with that set. Too pretty!